John Denver's Estate Presents The John Denver Celebration Concert - A night of John Denver's voice, songs, videos, and stories. 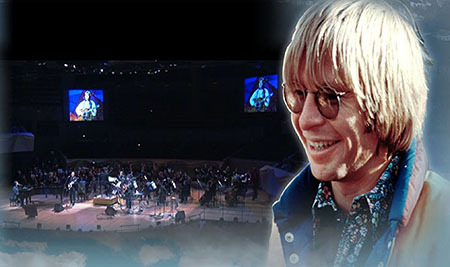 Hear John Denver sing and watch him perform on video screens while being backed live by members of his former touring band and accompanying string section. "Take Me Home, Country Roads," "Rocky Mountain High," "Sunshine on My Shoulders," "Annie's Song," "I'm Sorry," "Fly Away," "Back Home Again," and of course, "Thank God I'm a Country Boy," and more.